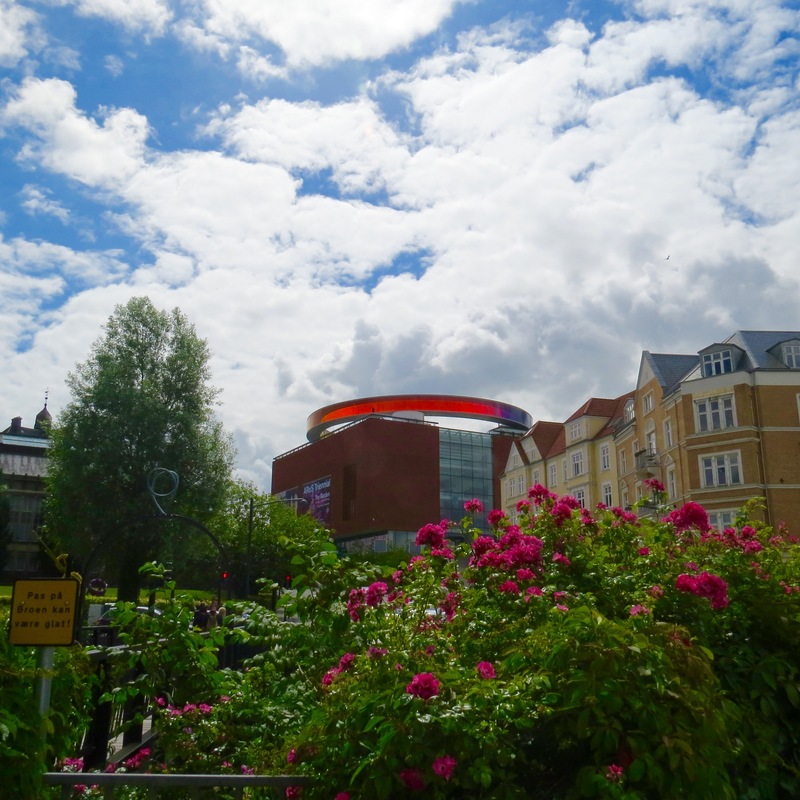 We discovered the European Commission had selected Aarhus the 2017 European Capital of Culture (along with Pafos, Cyprus), and the city ensures visitors understand why. 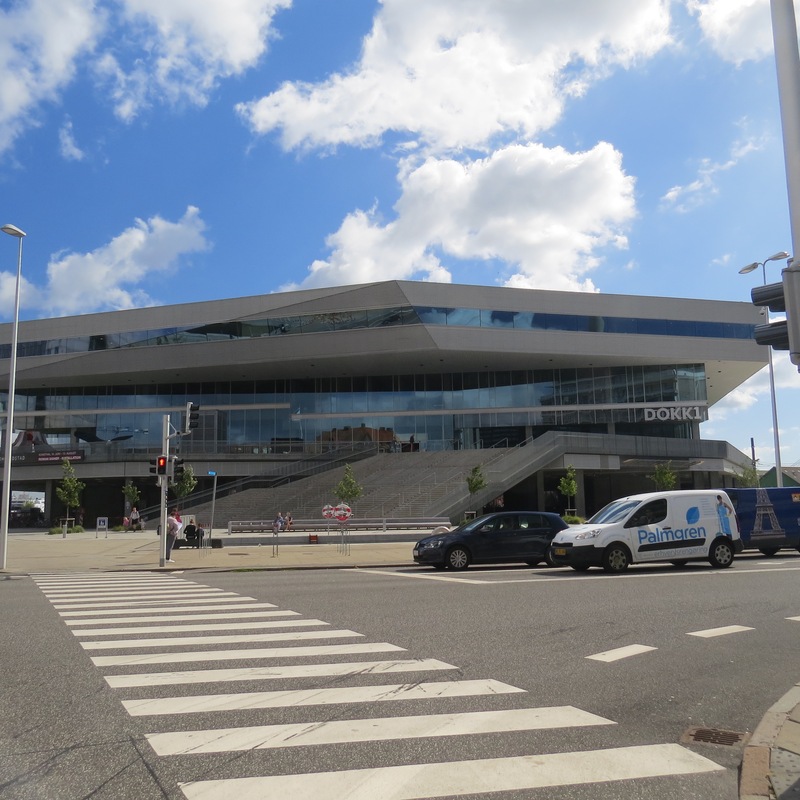 Special exhibits inside and out caught our attention, beginning with DOKK1, the large arts center (built 2015) housing the main library (the largest public library in Scandinavia), government service offices and a multi-purpose hall. With the Tourist Information located here, non-locals as well as locals take the angled steps up to the huge lobby area. Once inside you have your choice of information, books, computer stations (including 3-D printing), cafe or simply a peaceful place to sit. A huge vertical gong hangs at the top of the stairs overlooking the harbor. The night before with Steve, David and Ken we heard that the gong is rung whenever parents of a newborn press an alarm at Aarhus University Hospital. And, with so many areas devoted to children it must ring many, many times. or geometric trampolines. Wish they came in adult sizes. Before we left we explored another modern facility: the underground parking garage using robotics to park and stow cars. With spaces for 1,000 vehicles, the garage is the largest automatic car park in Europe. You could tell not just we were curious as a brochure, video and a helpful attendant explained how it worked. For anyone interested, check out www.dokk1-parkering.dk. We located the Aarhus Cathedral where construction, begun in the12th century, was completed in 1350 in the Romanesque style. One hundred years later the influence of the Hanseatic towns led to a redesign using Gothic features. 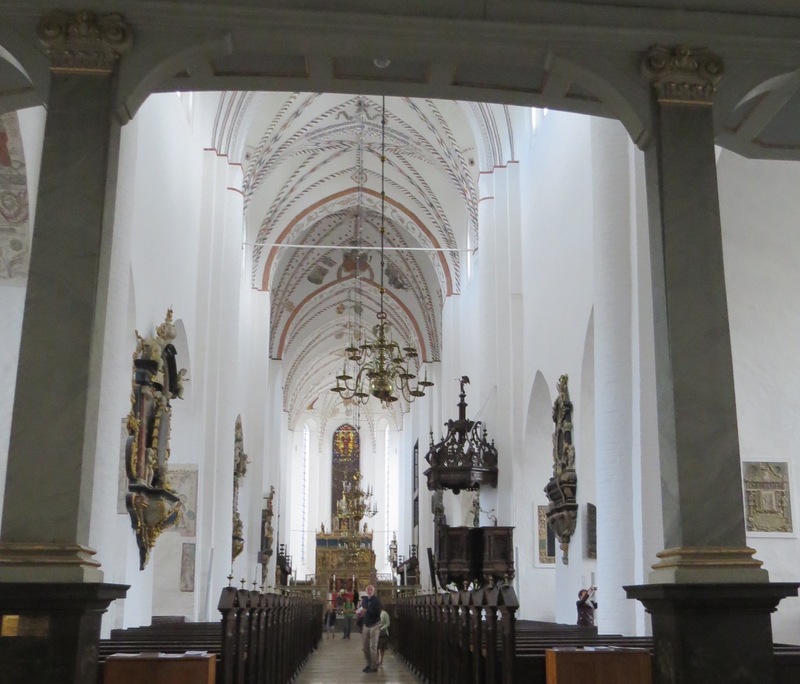 As the longest church in Denmark approximately 1200 worshipers can fill the pews. and, the Votive Ship UNITY from 1720. One restorer said it was built in Holland for Tsar Peter the Great as a model for his fleet of warships (models were used in lieu of drawings). This one floated almost unharmed to shore when the ship it was being transported to Russia on floundered off the Danish coast. The UNITY is the largest votive ship in Denmark. The reason for a votive ship is to represent man’s voyage from cradle to grave. Another treasure is the altarpiece created 1479 by master-craftsman Bernt Notke in Lubeck, Germany. It would be worth attending church during one of the religous holidays when the panels are unfolded. Walking towards one of the three museums we’d chosen for our two-day exploration we spotted a long row of outdoor billboards covered in magnificent photography. 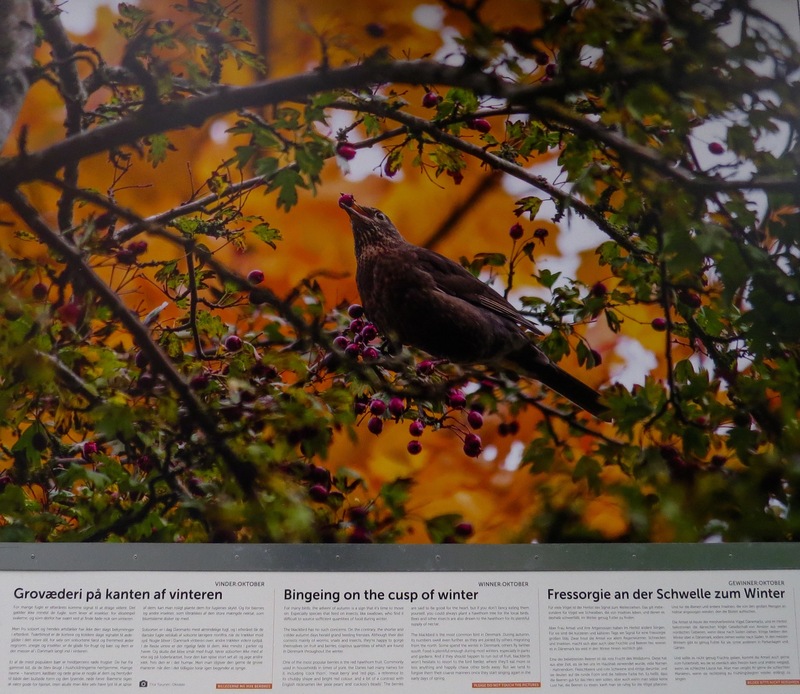 To showcase the flora and fauna located within this city’s environs the Natural History Museum held a contest soliciting individuals’ shots of nature found in Aarhus. 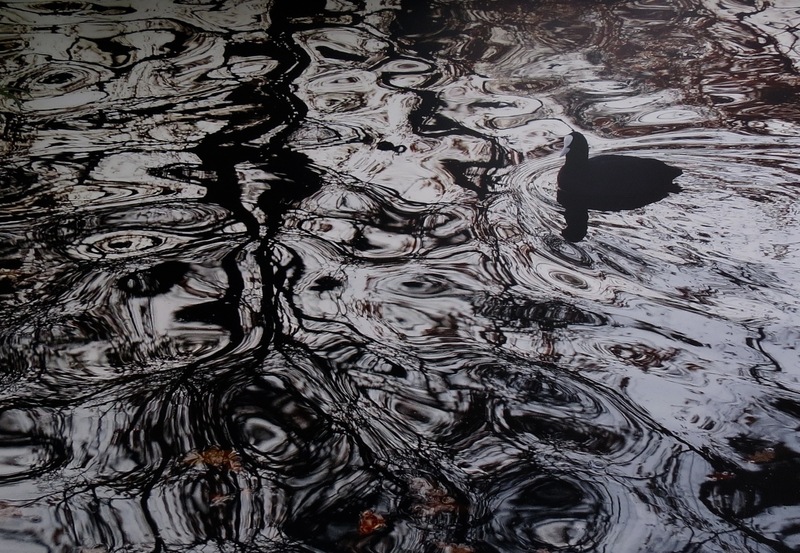 From approximately 2,500 photographs judges chose 100. 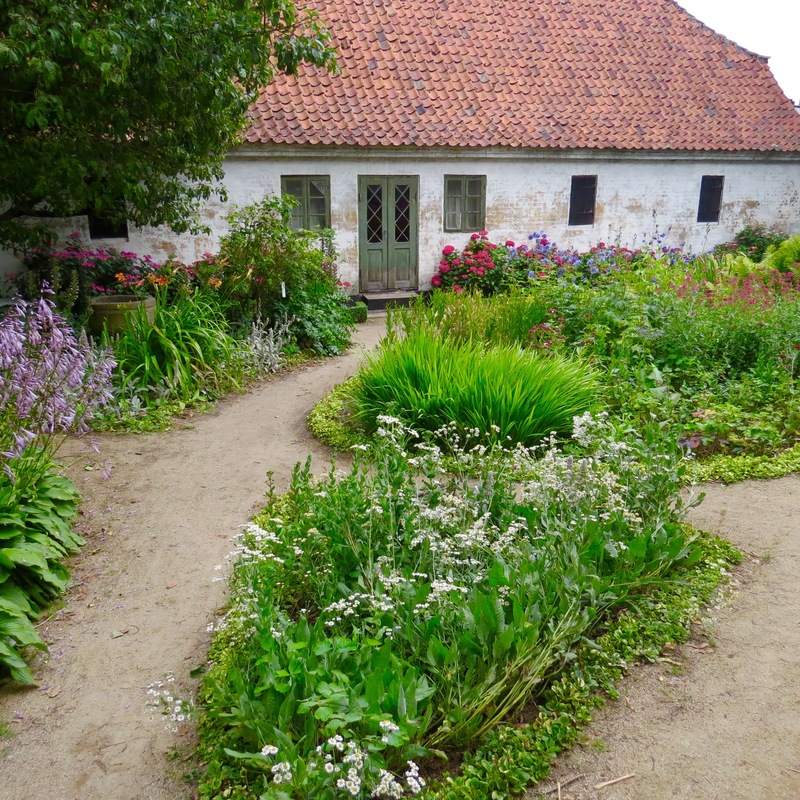 I could easily have spent over two hours being spellbound by this exhibit, but by now it was early afternoon and we needed to reach Den Gamle By, Aarhus’ open-air museum. 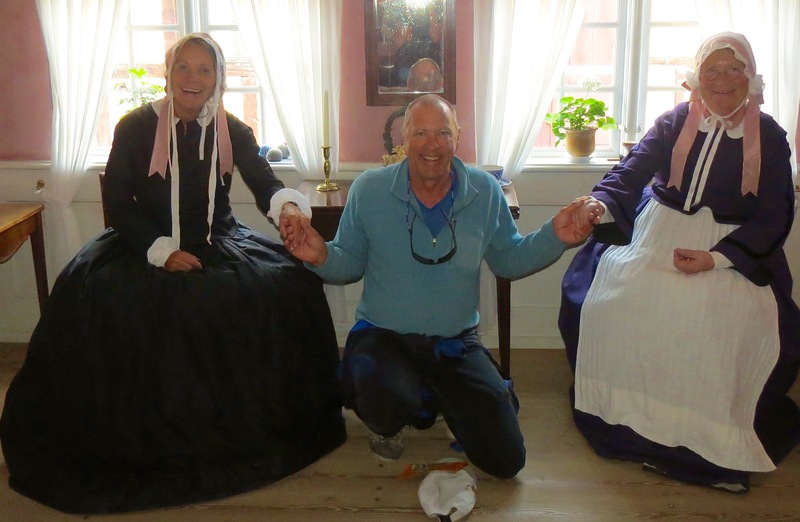 Showcasing three periods of history–from before the Industrial Revolution to the 1900s via architecture, artifacts, and special exhibits, this museum requires a good amount of strolling time to absorb the sights. With the sun out and being not too-mobbed with other tourists we began our visit with an introductory exhibit on Aarhus’ history. 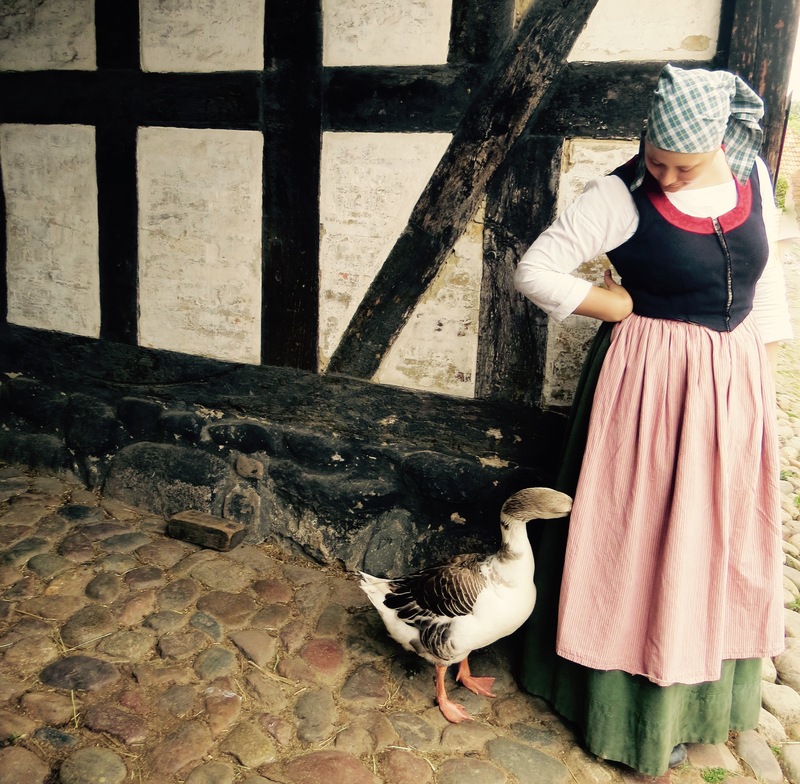 As we continued our touring we caught sight of another re-enactor, this time a young woman and her playful goose. with its homemade bird-scarer twirling away. Leaving this living history behind we returned to the 21st-century. We climbed a short hill to the Botanical Gardens where we purchased a rubber dinosaur and snake from the shop for keeping gulls at bay (supposedly) from JUANONA. 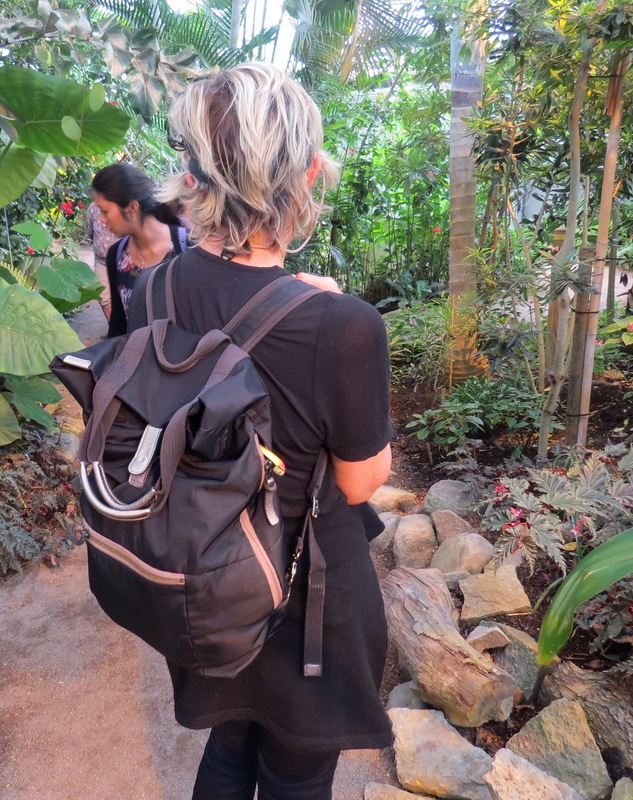 Just for fun we put one in my backpack with its head poking out as we walked through the various greenhouse climates. Unfortunately, no one noticed but, hey, it was worth a try. By now it was time to catch the bus back to Ebeltoft where we finally found the type of citrus popsicle Max had been hankering for. A young woman kindly let us snap a shot so he could show it to the shopkeeper. Meanwhile, I met Pineapple, a guinea pig being reunited with its owner. 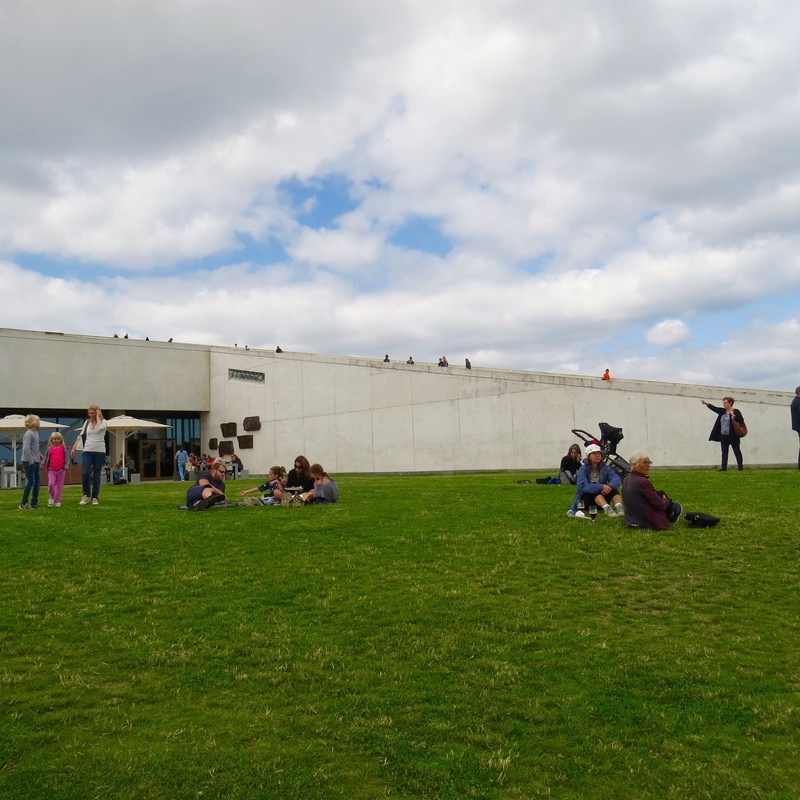 For Tuesday our list had two museums, the ARoS Aahrus Art Museum and the Mosegaard Museum. We had walked by the former the day before, capturing the permanent installation mounted approximately 12 ffeet above the roof. Called “Your rainbow panorama” visitors have a 360º view of the city. We managed to spot a window-cleaner ensuring that view sparkled. We hoped to return to this museum but for now we needed to catch a bus to the Mosegaard located about 20 minutes from the city. And, what a location and site. The grass-covered building offers an inviting tableau for outdoor refreshments as well as log-rolling down its slopes. The interior resembeles a terraced landscape featuring a mind-blowing display of early humans’ history, from Bronze Age (1700-500 B.C.E.) to the Vikings (800-1066 C.E.). As opposed to immediately becoming immersed in prehistoric times, the museum provides a wonderful introductory film titled “The Journey”. 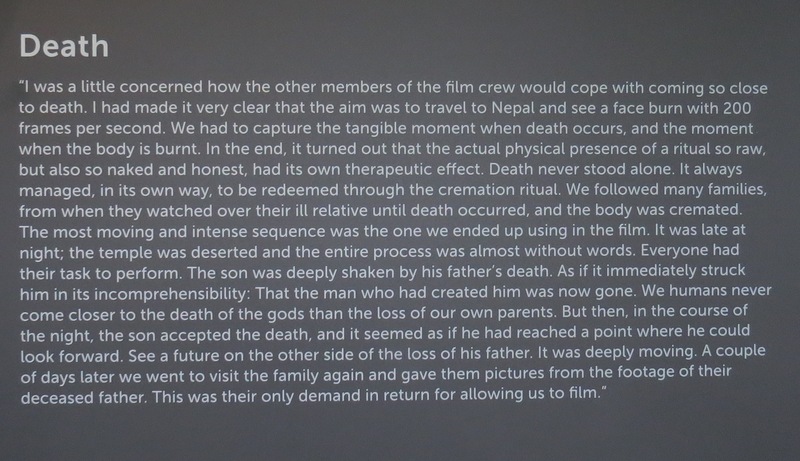 Displays both before and after the film explain the different scenes with glimpses of nature via virtual reality. 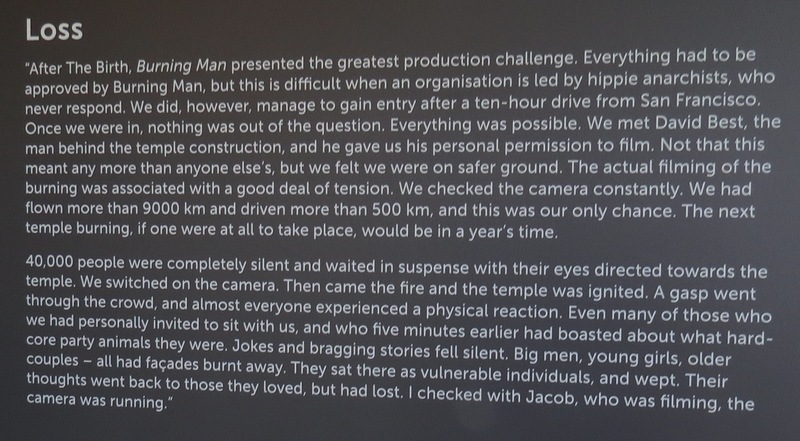 A bonus came from reading the filmographers’ stories of how they managed to capture these seven events. and ending up with Homo Sapiens. We entered the Bronze Age exhibit, then the Iron Age. The latter featured the Grauballe Man, the world’s best preserved bog body (Denmark has several of these in various museums around the country). 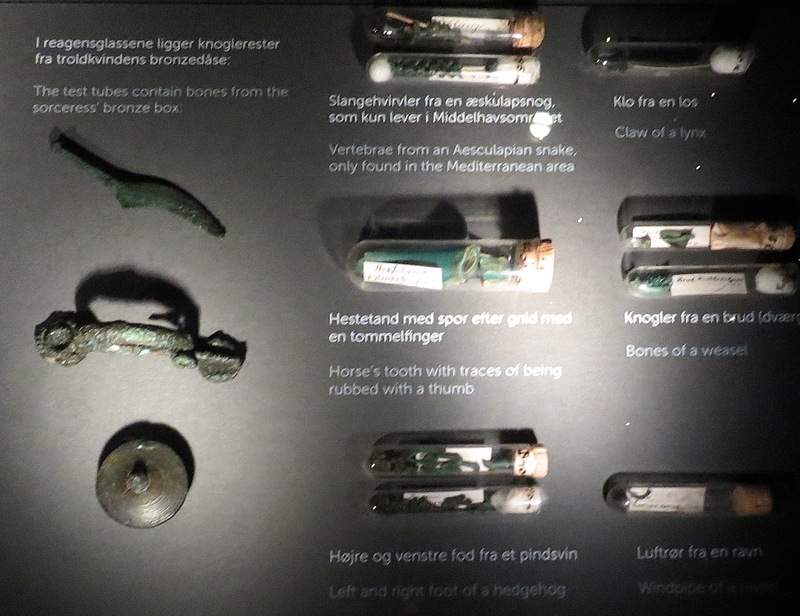 The museum highlights a specific battle from 205 C.E.–the Battle of Illerup Adal–and exhibits the discovered weaponery offered as thanks for the victory. The last permanent exhibit covers the Vikings, which added to the information we’ve picked up from previous museum visits. The museum does a wonderful job of immersing visitors in the day-to-day living of these early humans. So much so one realizes we have more in common with them than we may have originally thought. In short, our tour through the museum circles directly back to the introductory film. A nice way to end our day’s exploring. We ran out of time to see “The Life of the Dead”, an anthropology exhibit, and, by then our brains were mush anyhow. But, trust me, seeing the movie “The Journey” and experiencing the outdoor roof are worth the admission to this museum. and a walk back to the bus stop began our triip back to Aarhus then Ebeltoft and JUANONA. The art museum we’ve saved for another time, most likely a road trip sometime in our future.